Can You Cook Boxed Julienne Potatoes in a Crock Pot? When making oven-fried hash browns, choose your potatoes carefully. 1 Can You Cook Boxed Julienne Potatoes in a Crock Pot? Hash browns are commonly fried in a stove-top skillet with oil. However, oven-fried hash browns can be healthier, and you may find it’s a better way to get a golden crunch. Plus, cooking hash browns in an oven requires less babysitting and it frees up stove space to make other dishes while the hash browns occupy the oven. Use these guidelines as a base, and experiment with your own seasonings and toppings to make these hash browns your own. Pick your potato. Not all potatoes are created equal. Typically, Russet potatoes, Red potatoes and Yukon Gold potatoes all make great oven hash browns. Red potatoes pack a lot of flavor, but they can be more difficult to cut and handle. Yukon potatoes are bigger and easier to handle, but they are starchy and don’t have as much flavor. A Yukon Gold potato usually sits in a middle ground with lots of flavor and a little starch. Coarsely grate your potatoes using a cheese grater. According to your preference, you can leave the skin on the potatoes or peel the potatoes prior to grating them. After you grate the potatoes, squeeze the excess water from them. Some potatoes are more watery than others, so the amount of moisture will vary depending on the potatoes you chose. Add seasoning. Toss the potatoes in a couple of tablespoons of canola oil. Add salt, pepper and other seasonings as desired. You can even add some chili powder for some spice. If you like onion or cheese in your hash browns, you can finely chop some and add it to your potatoes. Place your potatoes on your buttered baking sheet and put it in the oven. You may want to turn them every 10 minutes, so that your hash browns bake evenly. They will usually take 30 to 40 minutes to bake to a delicious crisp. 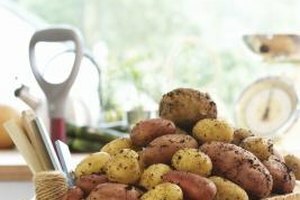 Grill a Chef: What Is the Difference in Potatoes?